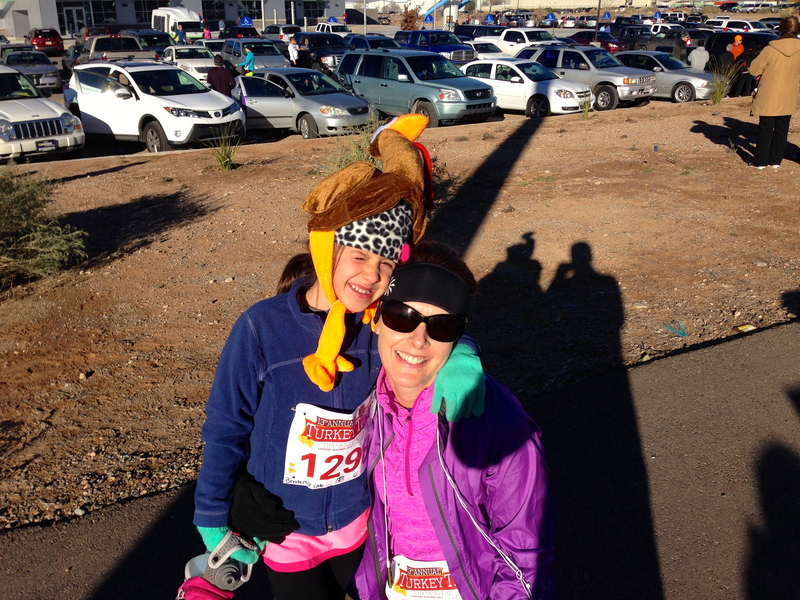 Since my husband and I moved to Albuquerque 12 years ago we have run the Turkey Trek every Thanksgiving. It’s a great way to start a day of gluttony and now that we have kids, a fun way to encourage them to be healthy. Since our kids are still little (3 and 6 yrs), my husband and I have to negotiate who has to push the kids in the stroller and who gets to run the race on there own. This year it was his turn to run. We both signed up for the Phoenix Rock and Roll Marathon (January 19, 2014) back in September with the thought of having our first running vacation. Then a week later I got hurt. I’ve had to abandon my marathon dreams for January, but Tom is still training hard, so since he had a Tempo run on schedule for Thanksgiving he ran the 5k. Tom ended up placing 4th in his age group after a super fast run on a super fast course. Our 6 year old decided after doing enough Kids K races over the last few years, that she was ready to jump to the 5k distance to run like mom and dad. 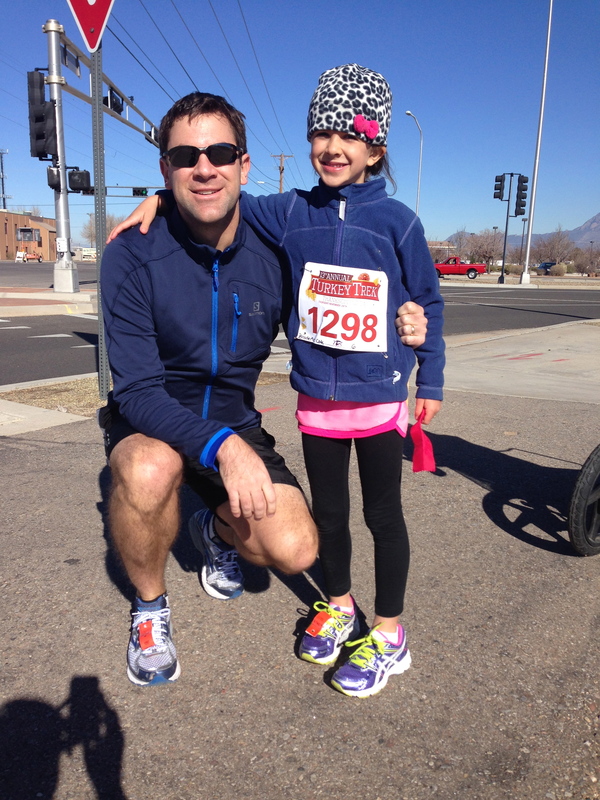 Her first race was back in August – The Blacklight Run – and she did fantastic! She ran almost the whole race and was so happy. She has done two more 5ks since then, so I knew she would want to run the Turkey Trek as well. 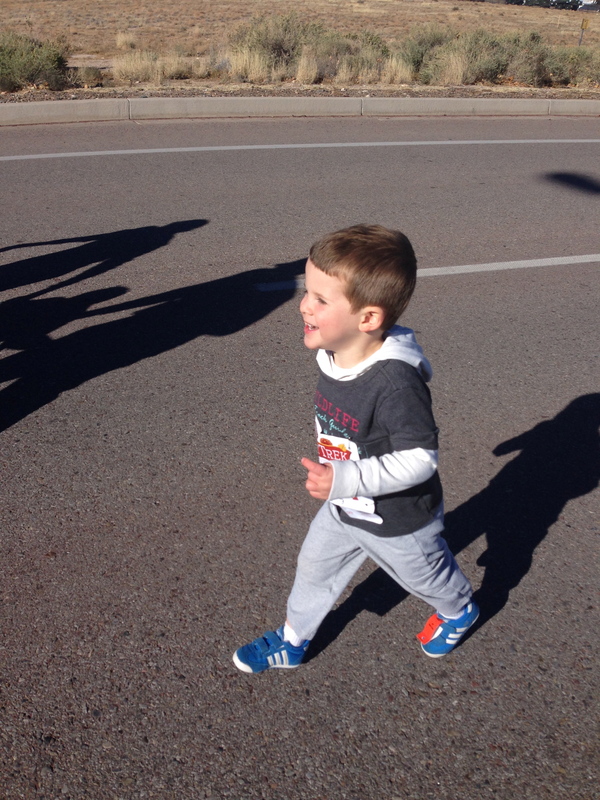 We bundled little brother up in the BOB stroller and took off at the start of the race….for about 100 feet. Then she wanted to walk and wasn’t real interested in running anymore of the race. So we enjoyed a nice 3.1 mile walk. It took us 56 minutes, but we enjoyed the weather, talked about what we were thankful for and all the fun things we are going to do between now and Christmas. We held hands as we walked and pushed the stroller and I just kept reminding myself that there won’t be very many more years when this little girl will want to walk 3 miles holding hands with her mom. After finally making it to the finish line of the 5k, it was time to get the little one pumped up for the Kids K and he was ready to run! When the starting gun went off he bolted away from me and zig zagged through all the other kids. Unfortunately, he fell just after the turn around and had to be carried for a bit. Once he saw the finish line, though, he was back to sprinting and finished strong. 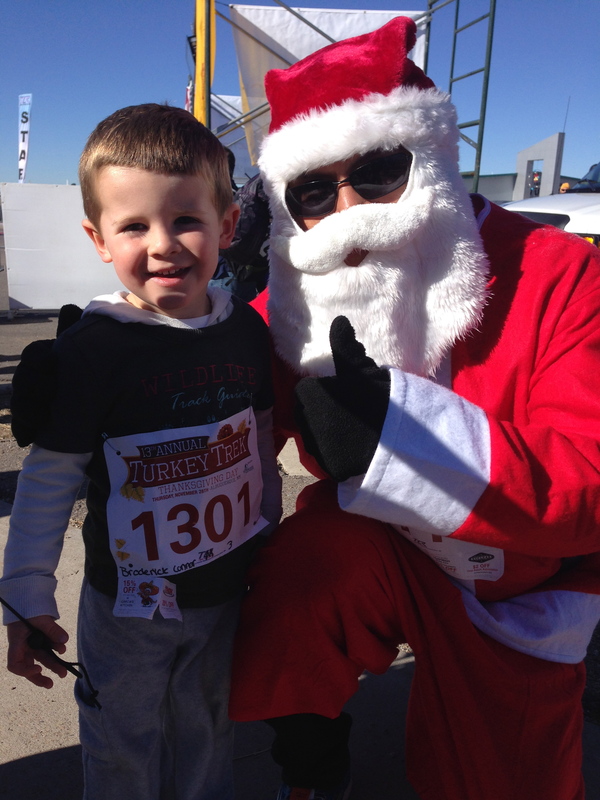 After the race he spotted a ‘running Santa’ and had to have his picture taken with him. Running Santa! He was pretty thin – must be training for a marathon. I submitted the picture to @therunchat for the Holiday to Holiday Running Scavenger Hunt – a fun way to spend your runs between now and Christmas searching for things on the list. After the races we headed home and since I hadn’t hit my 1 mile for the Runner’s World Holiday Running Streak yet, I headed out for a short jog on my own. My leg is feeling pretty good with lots of ice, stretching and the occasional ibuprofen, so I am going to continue to build my base. If I everything goes as planned over the next few weeks, I may still be able to do the Phoenix Rock and Roll Half Marathon in January, with a goal of just finishing the race. This injury has really made me realize that not all races have to be PRs and I need to enjoy the beauty of just being able to run. I’m thankful for the health of my family and that we were able to spend a beautiful morning being together.